MacDive supports powerful Cloud Syncing via Dropbox or iCloud. You can sync with MacDive on other OS X computers or on other iPhones. The Cloud Syncing guide covers the general details of syncing, while this page offers OS X specific information. Enabling cloud syncing with MacDive is easy. First, visit Preferences > Cloud. You can choose to sync via either Dropbox or iCloud (see Cloud Syncing for more information). Once you've chosen from the dropbown, check Enable cloud sync. That's it! If you've chosen to use Dropbox then you will be directed to a browser to login and authenticate. Follow the instructions and then make sure you click "Go to MacDive" once you're logged in. iCloud will use your macOS preferences and generally already be logged in, so there is no separate login required. iCloud requires macOS 10.11 or later. Once authenticated, MacDive will initialise itself with the cloud and then sync its data. As with enabling syncing on iOS, that's all you need to do. 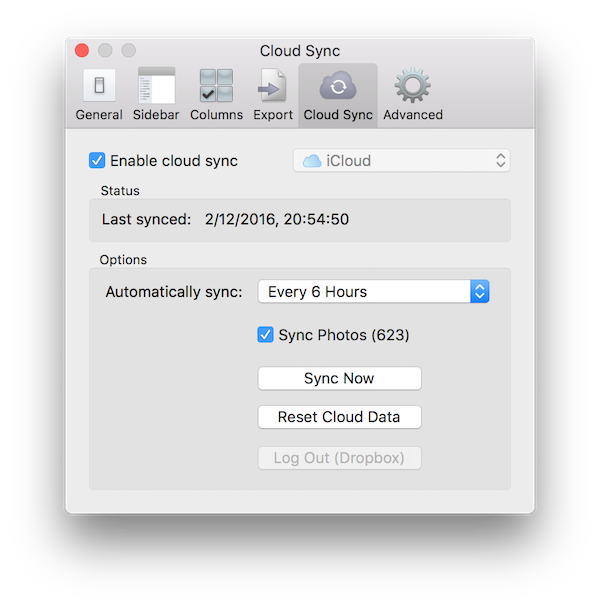 You can optionally configure how frequently MacDive will automatically sync (and it will always sync when you first start it), and whether or not you want to sync your Photos. There is a Sync Now button available in Cloud Preferences, and you can also find that in the quick action menu of the Toolbar.